Despite what I have just said about Avios and the BA Exec Club, I have to admit that before I was more fully clued up on how to maximise travel and leverage loyalty programmes, I joined up to the Virgin Atlantic Flying Club, hence the review. I believe that when compared to American & European based airlines that the service that Virgin Atlantic provides to their Economy and Premium Economy passengers is the best. However whilst their ‘Upper Class’ is good (certainly nothing to complain about), other airlines have now caught up and offer a superior Business Class product. Therefore you if plan to mainly travel long haul including mostly to the USA, I believe that Virgin Atantic is still a good choice and hence joining their Flying Club would be a good idea. 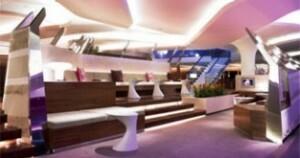 If you fly Upper Class or achieve Gold Status with the Flying Club then you will be able to access the legendary Virgin Atlantic club houses, which are the best airline lounges in the UK and amongst the best business class lounges in the world. I was fortunate enough to experience the club house when flying Premium Economy thanks to a special offer, and can testify that this is a great lounge. Like Avios you can opt to transfer your Tesco Clubcard points into Flying Club miles. Flying Club members earn 50 percent of miles flown on the cheapest seats in Virgin Atlantic’s economy class. While U.S.-based members are accustomed to earning 100 percent of miles flown even on deeply discounted economy fares, many international airlines don’t give any miles or only 25 percent for discount economy, so a 50 percent earn rate is not out of the norm. Other economy fares earn a full 100 percent of miles flown and Premium Economy class will net between 125 and 150 percent, and travelers in Upper Class can expect a full 150 to 200 percent bonus. Flying Club has many earning partners with which members can pad their mileage accounts, including hotels, car rentals, financial services, retailers and local partners. Virgin Atlantic is not part of one of the three global alliances, but offers partnerships with a large number of airlines, including Air China, Air Jamaica, Air New Zealand, All Nippon Airways, bmi, Continental Airlines, Gulf Air, Hawaiian Airlines, Jet Airways, Malaysia Airlines, SAS, Singapore Airlines, South African Airways, US Airways, Virgin America, V Australia and Virgin Blue. Virgin Atlantic offers co-branded credit cards to members residing in the U.K. and U.S. The Virgin Atlantic American Express card from MBNA is available to U.K. members. Reach that dream destination faster with up to 10,000 bonus miles when you apply by 31 March 2014 and spend £1,000 within 90 days of your account opening. However if you contact me (details at the end), I can refer you to join and you will receive an improved sign-up bonus. With up to 25,000 bonus miles when you apply by31 March 2014 and spend £2,000 within 90 days of your account opening, there’s no faster way to earn miles! Status is determined by tier points, which are earned based on the airline and type of fare. Generally, a one-way flight on Virgin Atlantic will earn two tier points in economy, three tier points in Premium Economy and five tier points in Upper Class. Members can also earn tier points with partner airlines, although the amount will vary depending on the partner and length of the flight. For example, most partner airline flights earn no tier points if the flight is under 2,000 miles and one tier point if over 2,000 miles; and one tier point in business and first class if the flight is under 2,000 miles and two tier points for flights over 2,000 miles. To reach Silver level, you’ll need 15 tier points in a 12-month period; and you’ll need to earn 10 points within the next 12 months to retain that status. Silver level offers members a 25 percent flight bonus, Premium Economy check in, priority waitlisting, discounted parking at Heathrow and Gatwick, four complimentary first class upgrade vouchers for Gatwick Express and Heathrow Express and complimentary Regus Businessworld Gold membership. Gold level requires 40 tier points; 30 tier points within the next 12 months to retain that status. Gold members receive Upper Class check in and priority boarding, access to Virgin Clubhouses for you and a guest, access to the bmi business lounge at London Heathrow, parking discounts and an extra 50 percent of miles flown. Other benefits include an extra 23kg baggage allowance; 10 complimentary first class upgrade vouchers for Gatwick Express and Heathrow Express; a guaranteed economy seat on any Virgin flight, provided a full-fare ticket is purchased at least three days prior to departure; fast track through security and immigration; a supplementary Silver card to give to a family member and a Family Account, enabling up to six members of your household aged 2 to 17 to earn miles that will be credited to your account. If you normally fly Economy or Premium Economy class and like flying to the USA, and would like to join the Virgin Atlantic Flying Club or are already a member but are not maximising the miles being added to your account and would like a Virgin Atlantic Credit Card then please contact me at Majury1981 AT GMAIL DOT COM, and I will endeavour to ensure that you get a better sign up bonus then if you joined either directly. Have you flown with Virgin Atlantic before or are you already a member of the Flying Club, then please leave a comment and let your fellow readers know!